We’re excited to announce our Simply The Best of Santa Barbara Spring Show! Save the date, it will be on March 10, 2019 at the Rockwood Santa Barbara Woman’s Club. Our unique wedding showcase delivers all the top wedding industry professionals of Santa Barbara in one place including caterers, DJs, photographers, florists, planners and more! Open to the public. Tickets can be purchased via Eventbrite, early bird tickets exclusives now available. Complimentary valet parking available. Presented by Burlap & Bordeaux, 50+ local and regional businesses will be available, like SPARK Creative Events, Dreams America Linen, Rewind Photography, 805 Catering, Tondi Gelato, Hilton Garden Inn Goleta and more! Vendors are still being accepted. Santa Barbara is a premier destination for weddings and special events! Wedding Planning made simple. All things wedding in one place. 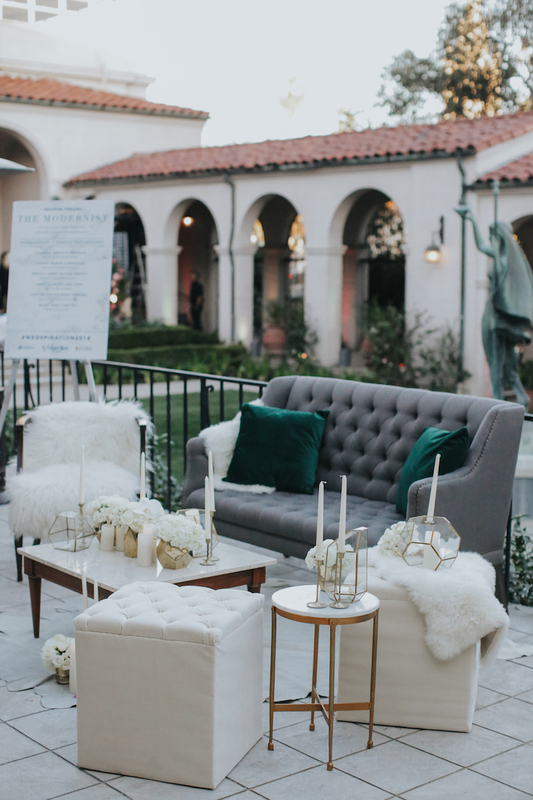 We're super excited to share that we were at Simply The Best of Santa Barbara Spring 2018 Wedding Showcase this past weekend. We had a great time at Rockwood Women's Club and met a bunch of great people! While we don't have all the beautiful photos from our professional photographer just yet, we wanted to share a few sneak peaks of our booth from our handy phone photos! In beautiful shades of pink and gold, we created a table top design with the prettiest details. From gold deco chargers to our all over gold gilded cake, our booth had to be one of the best! We also had florals running down our table in petite satellites which is very trendy right now. To complete our booth we teamed up with Desert 35 featuring their custom fragrance services. If you came to the show we also gave free samples to everyone in their swag bag! We had so much fun and can't wait for the next one! Wedspire and celebrity bride, Rachel Lindsay welcomed Burlap and Bordeaux to showcase and meet excited engaged couples at Wedspiration 2018! It was an evening of wedding inspiration and Wedspire’s debut of its newest content feature "Wedspiration". 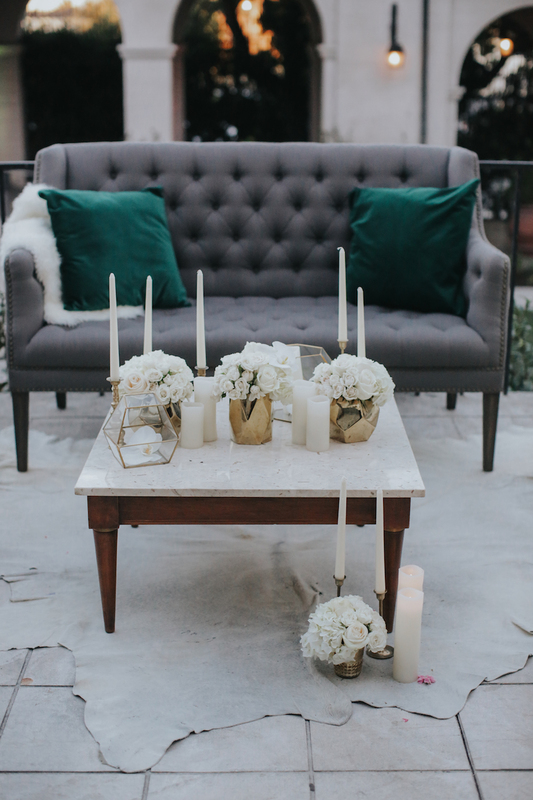 Keep scrolling to see our beautiful lounge vignette and details we created for this event! The evening began with an intimate Q&A with Rachel Lindsay as she answered questions on all things wedding and The Bachelorette. Guest were then ushered to the room over at Ebell of Los Angeles as they unveiled 12 unique design spaces. Every style persona is accommodated and couples are able to explore the venue and vendor's versatility. We featured a Moderist Cocktail Vignette design space which we would like to describe as very on trend, bold, colourful, patterned and textured! As guest walked around scrumptious hors d'oeuvres were tray passed and the bar served up delicious cocktails. The event also featured a silent disco with multiple djs and a swanky photobooth for guest to take photos of and remember this night!See below for some of our favorite photos!